What’s a Yaki-Tate melon pan (焼きたてメロンパン）？And how is it different from the normal melon pan sold at convenient stores and supermarkets? 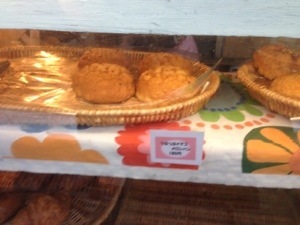 As you may know, melon pan is a melon-flavored bread. Bread in Japanese is ‘パン’ pronounced as ‘pan’. It is a round-shaped bread with rough sugary texture that looks like checker prints. I personally love this ever since I came to Japan. 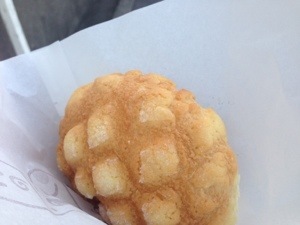 But last year, I found something even better than normal melon pan－Yaki-Tate melon pan　〔焼きたてメロンパン）! This literally means it is a melon pan that is fresh out of an oven. It may seem to be not so different from the normal melon pan, but I can tell you it really is. 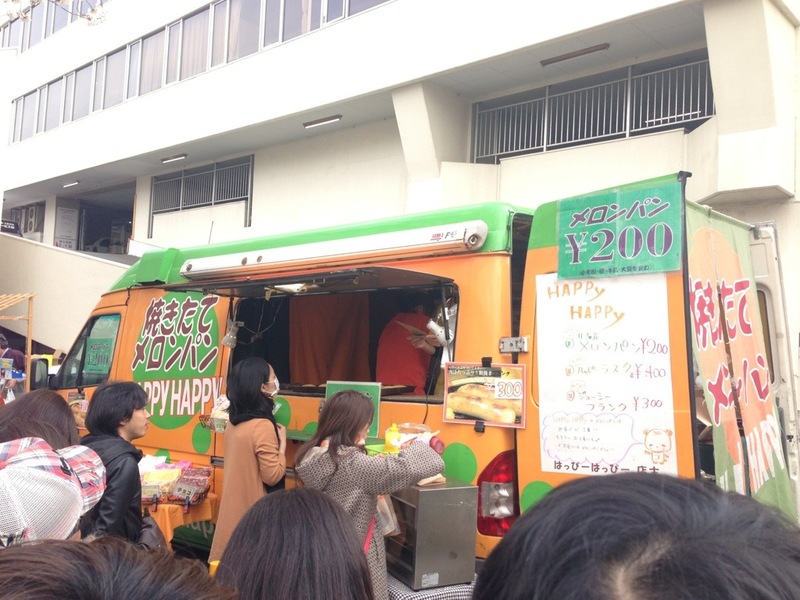 One day when I came out of my station and about to walk home, I saw this melon pan van. The smell was mouth-watering but I did not pay much attention and just walked away. The second time this van, there were so many people waiting in line and I thought…maybe this is good. So I bought one melon pan just to try if it was special. There were Hokkaido and butter flavors. I chose the butter one. The bread was freshly-baked from the oven. I took a bite and then…I LOVED IT! So soft and it tasted really good. Since then, I loved it and I looked forward to this van coming to my station every week. This is definitely different from normal melon pan sold at supermarkets. 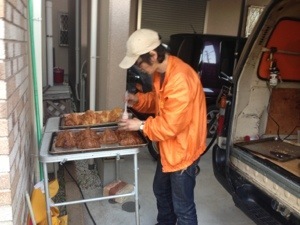 Obviously, it is sold in a van and since it is fresh out of the oven, it is hot, soft and just yummy! 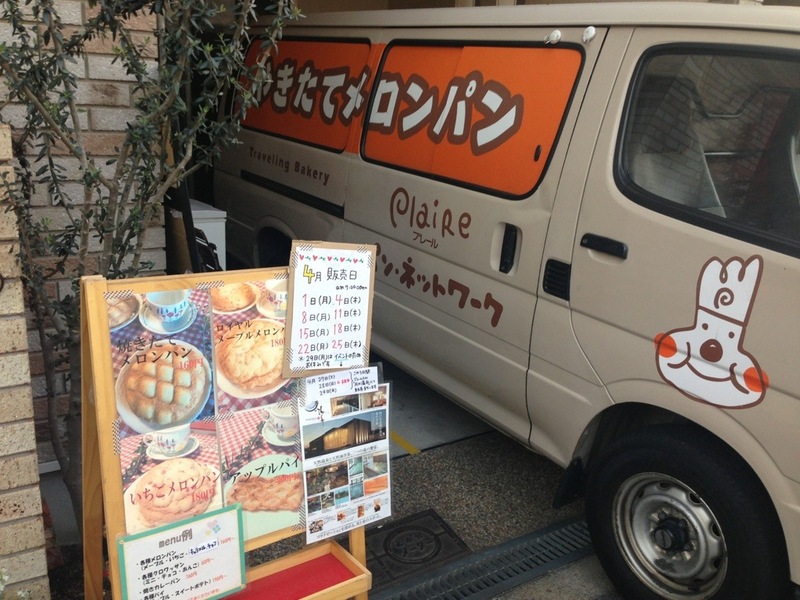 Apparently, it is not that easy to find this melon pan van. After I moved from Tokyo to Yokohama, I never saw this again until last month when I went to view sakura in Naka-Meguro 〔中目黒）. That’s when I found this van again. Judging from the long line of people, I guess I’m not the only one who love this! 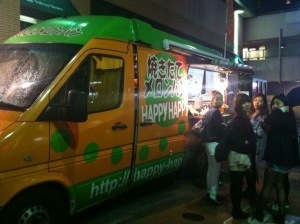 Other than the van HAPPY HAPPY in Tokyo, I also found one right near my place in Osaka. This van has even more flavor…even strawberry flavor. They also sell apple pie and others as well. If you like cats, then go to my page. the dawn, as i love to find out more and more. web site is something that is needed on the internet, someone with some originality! I’d love to try this! Thank you so much for posting. Can I ask where exactly it is in Osaka? Thank you!